Sheila Andrew supervises students conducting an ultrasound on a Holstein dairy cow. With close to 400 undergraduate and graduate students and a distinctive array of facilities, the Department of Animal Science provides opportunities for students with varied interests and goals. 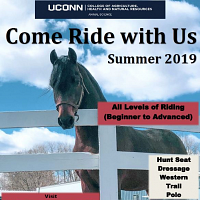 “What’s unique about UConn is that our animal facilities are an integral part of campus,” says Steven Zinn, professor and department head. These facilities consist of the horse unit as well as indoor and outdoor arenas; livestock units with beef cattle, sheep and swine; cattle resource unit for young cattle; the Kellogg Dairy Center, the poultry unit, the creamery and high-tech research and teaching labs. Animal units house 200 dairy animals that produce milk rated second in quality for all of New England, and in the top 20 for the entire USA. “We have some of the best milk in the region, and that goes into making the best ice cream in the state,” says Zinn. In addition to dairy cows, the department has 130 sheep, 50 beef cows, 85 horses, 25 pigs and 600 poultry birds that produce 5,500 eggs per week. Degrees conferred by the department include AAS, BS, MS and Ph.D. Undergraduate students may choose to focus on options within the animal science major such as pre-veterinary/pre-graduate school, equine science, bio-technology, animal production and food science. Approximately one-half of the graduates of the two-year program associate of applied science program continue their education. Those choosing to enter the workforce may work as horse trainers or horse facility assistant managers, or they enter a career in animal production. Four-year graduates often apply to a professional school such as veterinary or medical school, or to a physical therapy program. Graduates may decide to work in the pharmaceutical field, education, government agencies such as the USDA or APHIS or in production as trainers or managers. MS graduates often find positions within industry, education, extension or consulting, while Ph.D. degree holders seek opportunities in academia or industries such as food science. 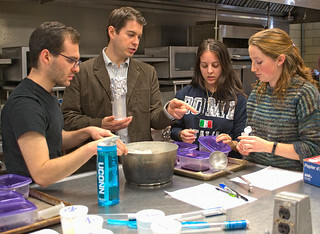 Dennis D’Amico works with students to develop aronia berry yogurt in his undergraduate Dairy Technology course. Professor Cindy Tian is involved in research on embryo-related biotechnology such as nuclear reprogramming and somatic cell nuclear transfer. This research may have future implications for both human and animal health. 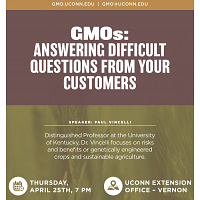 Assistant Professor Dennis D’Amico focuses on food microbiology and food safety, particularly control of food-borne pathogens in foods and food processing environments with dairy foods and artisan cheese. Associate Professor Sarah Reed, Associate Professor Kristen Govoni and Steven Zinn are researching poor maternal nutrition in sheep during gestation and the impact of this factor on offspring cell function, muscle development and growth rate. This research serves as a model for both animals and humans that may prove to have multigenerational implications. 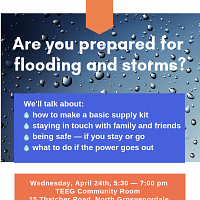 Several department faculty members are involved in outreach. Professor Sheila Andrew is the Connecticut State Dairy Extension Specialist. She supports local farms with mastitis detection and control, as well as nutritional management. Associate Professor Jenifer Nadeau serves as equine extension specialist focusing on equine health issues such as metabolic disease while also participating in many youth equine activities. Dennis D’Amico assists with dairy food safety education with raw milk and cheese producers. Executive Program Director Mary Margaret Cole was instrumental in bringing the new robotic milking system, also know as a voluntary milking system, to the campus’s dairy production operation. UConn is one of the first universities in the country to adopt this technology as a way to manage and study its dairy herd. The new technology will allow farmers to spend less time milking and more time focusing on their entire operation. Each robot milks 55 to 60 cows per day and will assist the next generation of dairy farmers with managing their herds. To highlight the implementation of the new system, University Communications recently produced a video, Happy Cows. 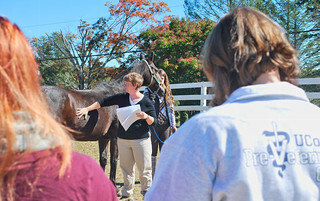 Jenifer Nadeau offers a demonstration at the department’s annual Connecticut Horse Symposium. The department dairy robotics open house held on September 6 was attended by students, staff, state representatives and local farmers. 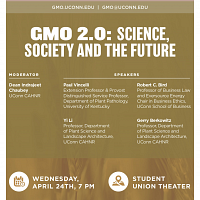 Speakers included Governor Dannel Malloy, State Representative Gregg Haddad, Connecticut Department of Agriculture Commissioner Steve Reviczky, Provost Craig Kennedy, Dean Cameron Faustman and Zinn. The department will host a robotic milking conference on Friday, October 26. This entry was posted in Animals, Extension, Faculty, Food, Research, Staff, Stories.